This beautiful rock was painted for me by talented Portland OR artist Connie Bowen. I’m delighted to say that Connie is also a good friend! Connie headed to the Oregon coast back in December. She wanted to spend a few days enjoying the surf and sand with her dog, Jesse, and to do some painting while she relaxed to the sound of waves crashing on the beach. I had no idea one of the pieces she would create would be this stunning rock! 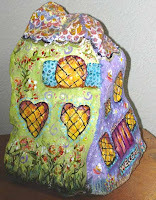 When she presented it to me a few weeks ago, I fell in love with the whimsical design and vivid colors. Connie even painted my four kitties, standing at the window. I’m sure they’re looking at the birds visiting the feeders and squirrels running on the deck! I love rocks. They nest in bowls inside and outside my home. Many of the stones and boulders that grace my yard were handpicked by me at local quarries. The 150 ft. rock wall that runs behind my cat enclosure is a source of constant delight, as I watch the many critters throughout the year who make their homes within its nooks and crannies. On the day that I lost my beloved dog, Martha, back in 1995, I held her furry body in my arms as the veterinarian administered the medication that ended her physical suffering. I had been saving a small rock that was special to me. I ran it over her body as she left this life, to capture and forever hold the magical essence that was the heart and soul of my dear four-legged friend. So, you can see that rocks have a very important place in my life! Thank you, Connie, for gifting me with such a precious piece. I will treasure it always. To learn more about Connie and see her breathtaking pet portraits be sure to visit her at http://conniebowen.homestead.com/homepage.html. Whether it be a pebble, stone or boulder, if you hear a rock asking to come home with you I hope you will listen to it, for it may come bearing a magical gift…just for you!